Note: We recommend that you only use this software as a last resort and upon recommendation from a tech support representative from MIDI Works. Download the Firmware Uploader and run it. If you follow the instructions, the LED on the CMK3 Circuitboard will be flashing rapidly (firmware upgrade mode). If the "Load into CMK" icon has not lit up, click on "Rescan". 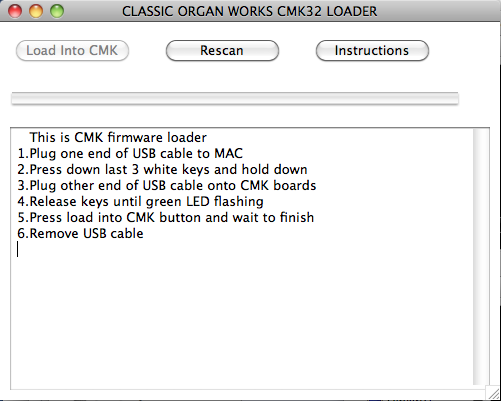 This should detect the CMK if it is in firmware upgrade mode. Once the loader has rescanned the keyboard, the "Load into CMK" icon should be live.